Janet Wass creates simple, elegant jewellery delicately laced with pattern. 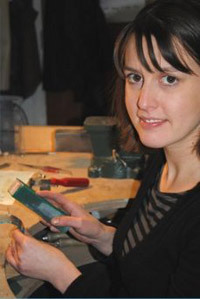 She fuses her passion for jewellery with her love of photography, incorporating photographically produced imagery within her designs, using laser-cutting and photo-etching alongside traditional jewellery making techniques. Magnifying often neglected details from the everyday world, she works using sterling silver and colourful synthetic materials to create insipring, desirable and wearable pieces.